Ryan’s little bro making a name for himself, getting through over the precocious 15-year-old Kwiatkowski. Zivkovic continues the kind of play that saw him reach the semis of four Futures events last year, again at the expense of a game, young British competitor (he beat Oliver Golding in a tough first round on his way to the Mexico F8 semis this past November). Sajous, the Plantation-based local fave who lost to Wayne Odesnik in the wildcard tourney, takes a tough loss at the hands of erstwhile Oklahoma Sooner Andrei Daescu. Challenger Tennis 2011 Player To Watch Andrea Collarini with a decisive victory over UCLA freshman Kosakowski. Collarini has now drawn top seed Jesse Levine in the main draw. I’m excited to see how Andrea fares in that one. Zivkovic goes from second seed in quals to facing the main draw second seed in the form of Mr. Alex Bogdanovic. Daescu slated to meet Simmonds in the main, in a Q v Q clash. Harrison gets to test his mettle against fellow promising junior Jeremy Efferding. Craciun gets a crack at Odesnik in the first round. And Kwon gets the big Slovenian Luka Gregorc. So look, people. It’s no secret, and there’s no need to pussyfoot around it. Let’s just get it right out there in the open: I’ve been horribly remiss in not giving you any updates from the Futures tour this week, it’s true. But here are my excuses: 1) the Sao Paulo Challenger has completely overshadowed the Brazil F2 Futures tourney in Salvador, even though Salvador is Brazil’s capital of happiness; b) I’m moving to Florida, duh, and such things require preparation that may limit my coverage and/or output; iii) though it may take place in Brazil’s happiness capital, the $10K Brazil F2 has an extremely watered-down field and didn’t really merit coverage until this weekend. I mean, I know my job here is to chronicle and celebrate and all, but with only 11 Top Thousand players in the Salvador field, and an 8th seeded player ranked #658 in the world, well… it’s hard to get inspired about day-to-day coverage until the weekend, I admit. But I will now, OK? So, in a tournament where the top 3 seeds are the only ones in the Top 400, and the rest of the field is outside the Top 500, it should come as no surprise that the top seeds are the ones who made it to the final weekend, no? For me, the tournament started on Saturday, as it was almost predestined that #1 Eladio Ribeiro Neto (ATP #317), #2 Andre Begemann (#348), #3 Andre Miele (#398) and #4 Thales Turini (#530) would make it through to the final four. Three Brazilians, two Andres and one German (Begemann). But who would win out of them? The answer may surprise you! Well, the semifinals may not surprise you, as top-seeded Ribeiro continued his dominance over 4th seed Turini, 7-6(3) 7-5, for his third win in three tries in this inter-Brazilian affair. The 21 year-old Turini has yet to win a set over his 25 year-old countryman. But second seeded Begemann had a tougher time against the third seed Miele, eking out a close 6-7(4) 6-4 6-4 win and evening their head-to-head at one apiece in this inter-Andre affair. But in the finals? Surprise! The second seed (Begemann, for those hard of memory) upset the 1st (Ribeiro-Neto, ditto), 1-6 6-4 6-4 to take the Salvador da Bahia title. The win indicates a profound change in fortunes for the 26 year-old German, who just five months ago was at a career high #166 in the world, after reaching the semifinals at the Nottingham Challenger (l. Go Soeda) and almost making the main draw at Wimbledon. He also partnered Dustin Brown to a dubs final at the Cairo Challenger and won the Zagreb Challenger championship teamed up with Matt Ebden. But then, after a retirement in Round 2 of the Winnetka Challenger, the former Pepperdine standout went 1/15 for the rest of the year, his ranking plummeting almost 200 places. So, to say that this was a surprise result would actually be a bit of an understatement, I’d say. Talk about turning over a new leaf in the new year! Meanwhile, in Plantation, Florida, the $10K USA F1 Futures are underway with a lot of interesting stories already (and the main draw hasn’t even begun). 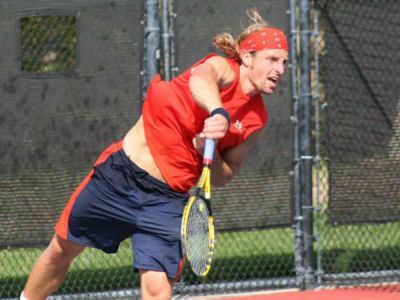 Not the least of which is the return of Wayne Odesnik, the self-proclaimed “American Nadal” (he’s a lefty, he likes clay, just go with it), from a slashed-in-half two-year drug suspension, his penalty reduced due to the ongoing “Substantial Assistance” he’s been providing to the ITF (Code Name: Whistleblower). I’m not big on moralizing/judging, so I’ll steer clear of L’affaire Odesnik for now, and will just note that it’s happening.